The 2015–16 European migration crisis put unprecedented strain on EU and national migration systems, and exposed the limits of EU funding mechanisms when pressed to keep pace with rapidly changing migration conditions. Since then, finding ways to better manage migration and help newcomers integrate into European societies has shot to the top of EU, Member State, and local policy agendas. 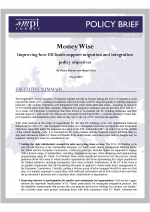 European policymakers are in the midst of negotiating the next multiannual financial framework (MFF)—the European Union’s budget framework through 2027—making this an important time to reflect on how EU financial instruments could be adjusted to reflect the increased importance and changed face of migration and integration policy in Europe. This policy brief explores three key challenges: (1) how to make EU funds more inclusive by involving diverse and on-the-ground stakeholders in decision-making processes, (2) how to make sure that these financial instruments complement each other and other EU policy tools, and (3) how to ensure that decisions about EU funds are made based on solid evidence of what has and has not worked in the past. Through a close look at the European Social Fund (ESF) and Asylum, Migration, and Integration Fund (AMIF), the brief offers recommendations for increasing the participation of small and community-led organizations, improving accountability and reporting systems, and more.